NOTES surgery in a new modality of minimally invasive surgery. Transvaginal approach is the most used one to perform intraabdominal human procedures. We must know if this new approach is better of laparoscopic surgery in some questions, like the surgical site infection. Prospective non-randomized clinical series of 50 patients with elective cholecystectomy for gallstones. 25 patients with transvaginal hybrid NOTES surgery and 25 with a conventional laparoscopic approach. Surgical infection in both groups was evaluated: general infections, surgical site infections and intraabdominal infections. We found an urinary infection in one case with transvaginal approach (the eigth case: we performed rutinary urethral catheterization in the first ten cases) and one umbilical site infection in laparoscopic group. No intraabdominal infections were found in the study. 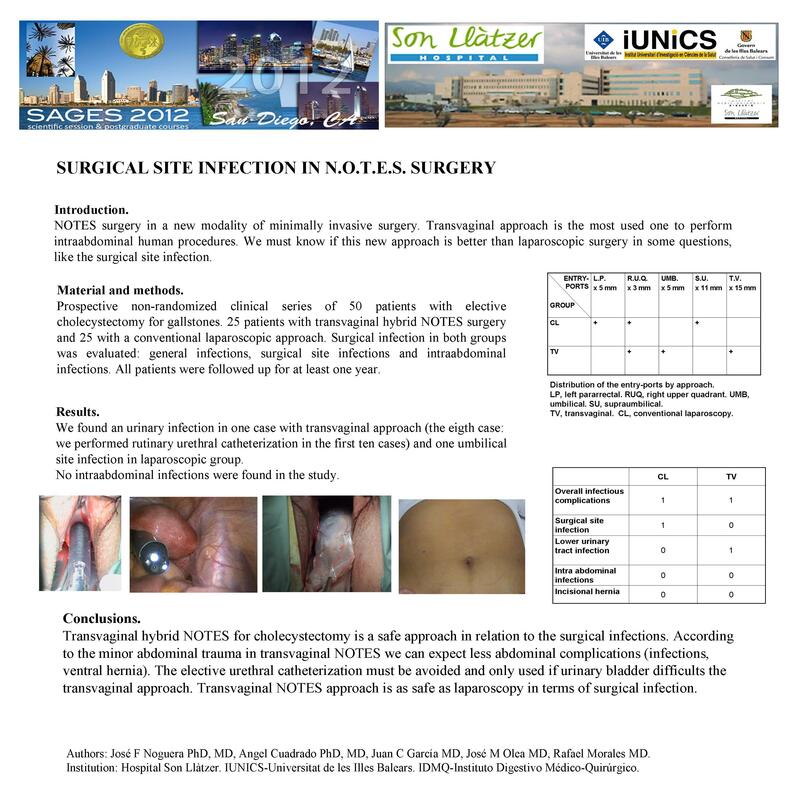 Transvaginal hybrid NOTES for cholecystectomy is a safe approach in relation to the surgical infections. According to the minor abdominal trauma in transvaginal NOTES we can expect less abdominal complications (infections, ventral hernia). The elective urethral catheterization must be avoided and only used if urinary bladder difficult the transvaginal approach. Transvaginal NOTES approach is as safe as laparoscopy in terms of surgical infection.